Since today is National Coffee Day, and Halloween is right around the corner, I figured there’s no better time to share this fun DIY Halloween coffee mug complete with a delectable coffee recipe made with Dunkin’ Donuts coffee! And to make it even more fun, I’ll also show you how to put together an adorable Halloween gift basket that is perfect for coffee lovers, teachers, neighbors and friends. Ready to get started? This DIY Halloween coffee mug is not only cute, it’s also easy to make. I used my Cricut Explore Air, but if you don’t have a Cricut or other die cut machine don’t worry! You can easily use waterproof craft paint instead. Simply download a few pictures of ghosts, print them on cardstock, then carefully cut them out to use as stencils. 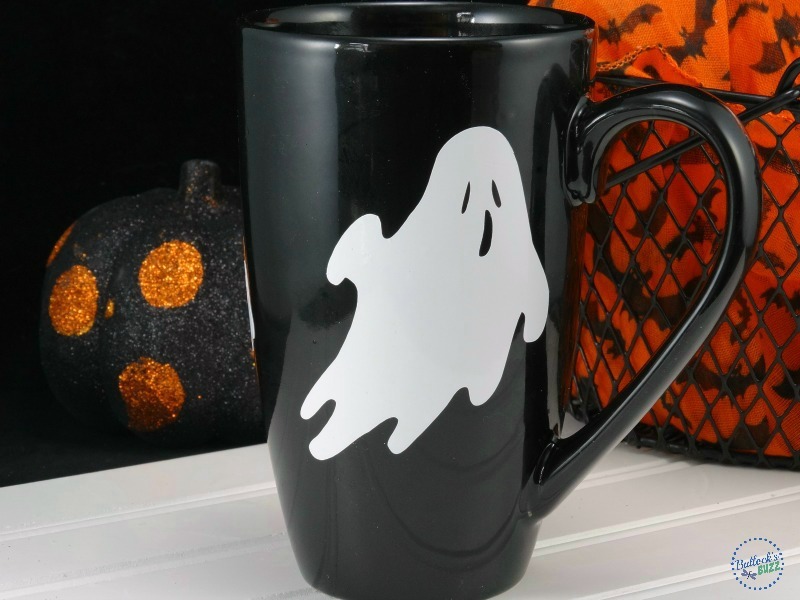 Here’s how to make this fun DIY Halloween Coffee Mug. Begin by cleaning the mug with rubbing alcohol to remove any grease or dirt. Once it’s clean, try to avoid touching the mug anywhere other than the handle. Next, open up a new project in Cricut Design Space. Begin adding the text in whichever font you’d like. I used A Frightful Affair for the words Coffee and Spooky, and Anna’s Fancy Lettering-Hannah for the rest. 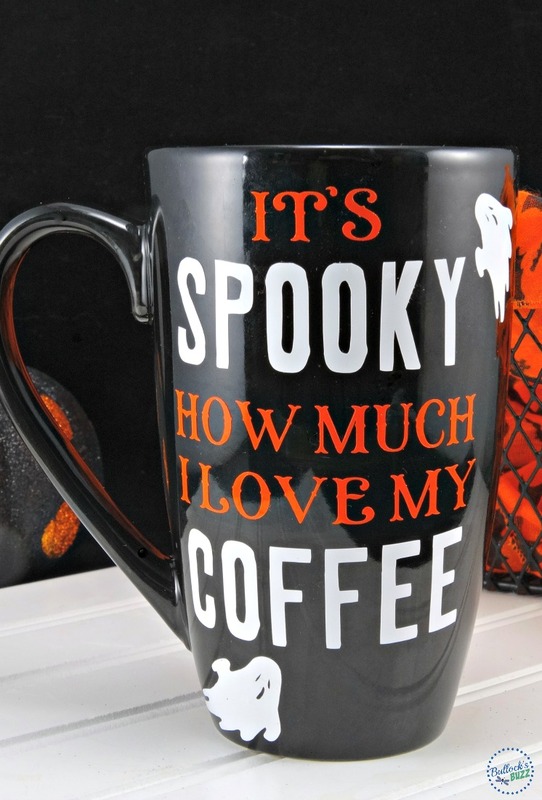 the words Spooky and Coffee measure 2.75″ wide and 0.91″ tall. the word It’s measures 1.07″ wide and 0.41″ tall. 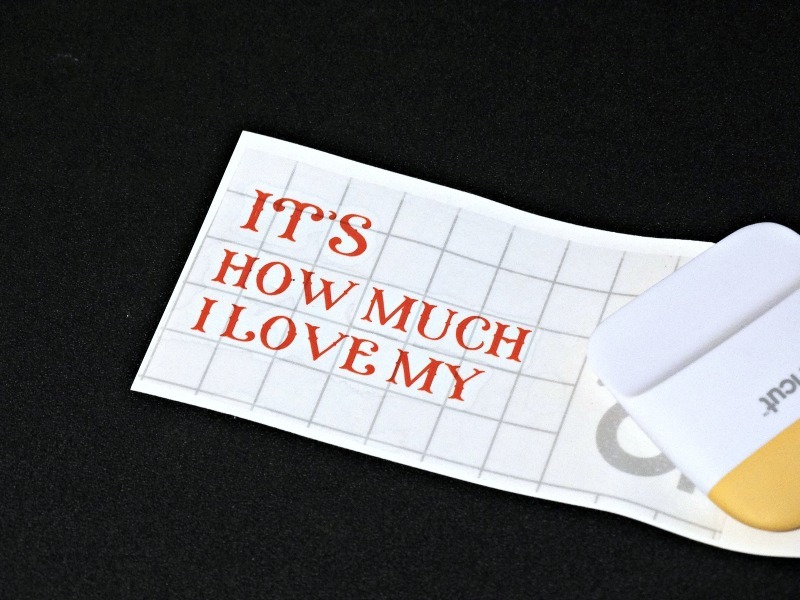 both How Much and I Love My measure 3″ wide and 0.41″ tall. Now add the images of ghosts, making sure to adjust the size as needed. For my mug, the large ghost measures 2.28″ wide and 2.5″ tall. The small ghosts measure 0.91″ wide and 1.0″ tall. Once your design is ready to be cut, place your vinyl on the mat, make sure your machine is set to Vinyl, and hit ‘Go’. Now sit back and let the machine do its thing. Once everything is cut, gently remove the vinyl from the mat. Then, slowly peel off all of the excess vinyl surrounding the design. Use the weeding tool to remove any remaining vinyl you do not need. Once you have finished weeding, cut a piece of transfer tape to size. Peel the backing off of the transfer tape and apply the grid-side over each design. Be sure to smooth over your design a few times to adhere the transfer tape. Tip: I find it easiest to first cover the entire design with one piece of contact paper, and then go back and cut the design into its individual pieces. Next, turn each piece of the design over and gently peel the original backing away from the vinyl leaving the words and images imprinted onto the transfer tape. Lay each piece of the design (one at a time) on the mug where you want it. 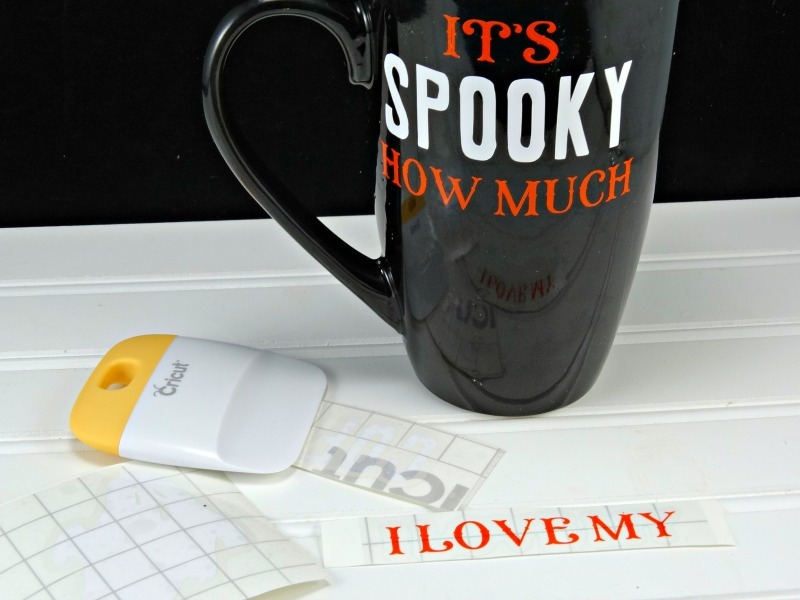 Go over it a few times using a Cricut spatula or a credit card edge to ensure the vinyl sticks to the mug, and then slowly peel off the transfer tape. Repeat for each piece of the design. And that’s it! Cute, isn’t it?! Make sure you wait at least a day before using the mug to give the vinyl time to fully adhere to the mug. Even though the vinyl is supposed to be dishwasher safe, I recommend hand washing the mug so it will last a long time. Now that your Halloween coffee mug is finished, how about a delicious coffee recipe to pour in it? This Hazelnut Mocha Delight coffee recipe is one of my fall favorites. Made with Dunkin’ Donuts Dark Roast, chocolate syrup, hazelnut syrup, and a few other tasty ingredients, it’s heaven in a mug! While the coffee brews, place chocolate syrup, hazelnut syrup, vanilla and whole milk in a mug. 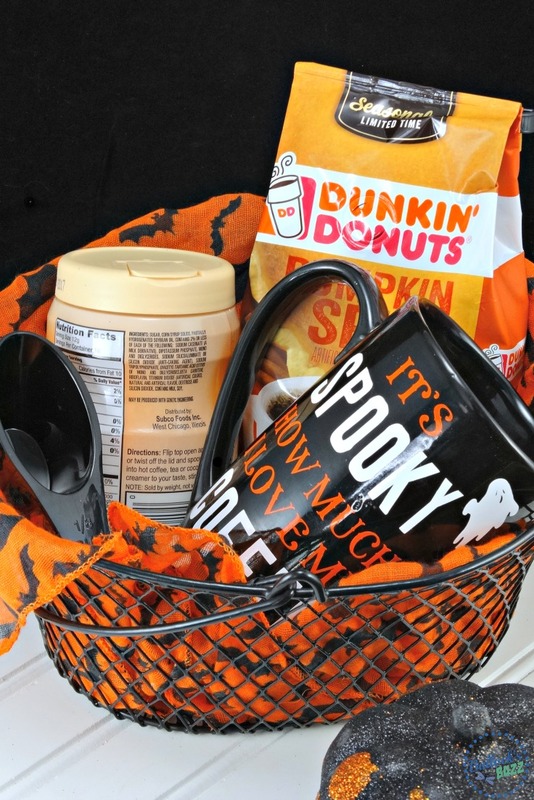 If you need a creative Halloween treat, why not make a coffee lover’s gift basket using the coffee mug? Simply find a cute basket, line it with Halloween-themed tissue paper, fabric or anything else you’d like. Include the coffee mug, a coffee scoop and a bag of Dunkin’ Donuts Dark Roast or any other tasty flavor! I added Dunkin’ Donuts Pumpkin Spice in mine to go along with the Fall/Halloween theme. Speaking of Dunkin’ Donuts, did you know you can enjoy your favorite signature Dunkin’ Donuts coffee from the comfort of your home? I’m talking all of your favorite roasts including Seasonal flavors and even a Bakery Series! And if you haven’t tried the Dunkin’ Donuts Bakery Series, you are seriously missing out! There are all sorts of amazing flavors including Cinnamon Coffee Roll, Vanilla Cupcake, Blueberry Muffin and even Caramel Coffee Cake! It’s liquid dessert in a cup! Dunkin at Home coffees come in both bags and K-cups, and can be found at your favorite grocery. 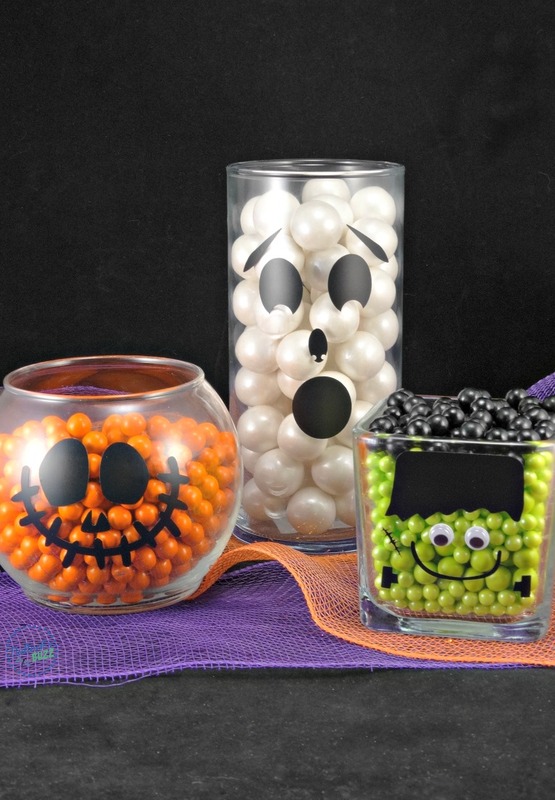 Check out these DIY Halloween Craft Candy Treats! 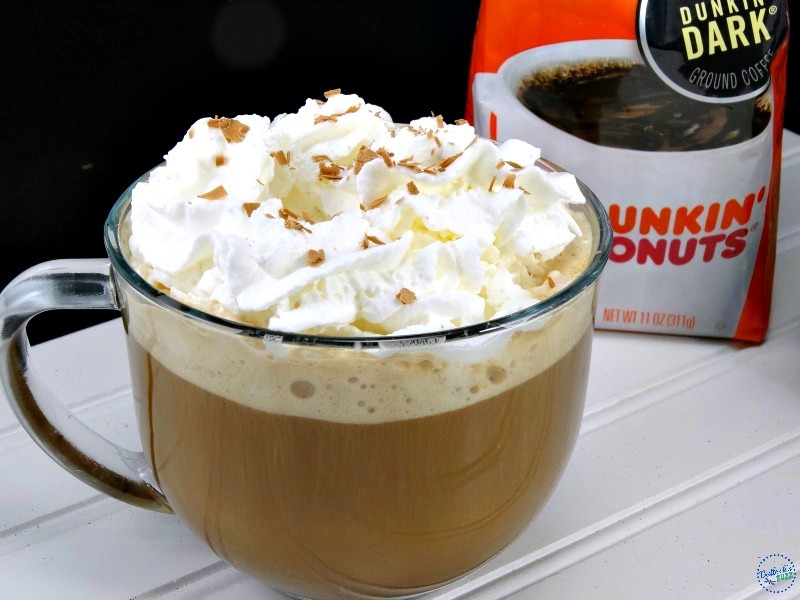 Do you have a favorite coffee recipe you like to make with Dunkin’ Donuts coffee? Share with us below! Oh, that is just so cute! Nothing’s better than a cool mug and a GOOD cup of coffee. Love it. I don’t have this machine, but it looks like a lot of fun to make! I wish I did! I could make a lot of great christmas gifts with this. I adore my Cricut! They are definitely worth having! I have never had Dunkin Donuts coffee and I really need to right that wrong. There isn’t one near us but there is one in the city our daughter lives in. I’m putting a stop there on my to-do list right now. I’d love to try their coffee, I hear good things about it all the time. I tried their coffee when I was on vacation last year. Unfortunately, we don’t have a store near us either! I am so happy I can buy it at the grocery – it is YUMMY!It really does taste as good as the ones you’d get at their stores! I love the idea of making my own Halloween coffee mug, this came out wonderful! I Love it. Thank you! It was very easy, and lots of fun! That is the cutest Halloween mug I’ve seen! I would love to make my own mugs for fall! Great ideas! That mug is ADORABLE! I wish I had a Cricut! I’m not very crafty, but I know I could do that! Coffee sounds good right now, but if I have any now I’ll be up all night lol. Thank you! 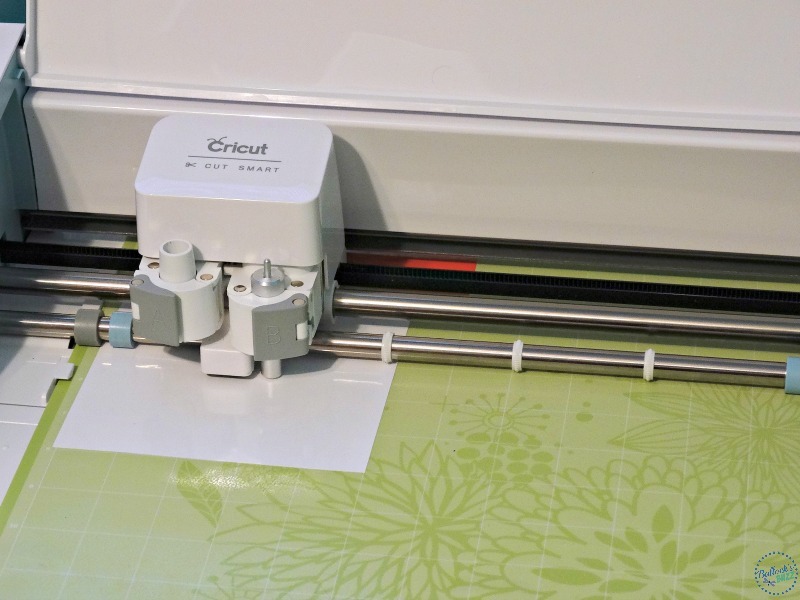 I love my Cricut – it really helps people like me who can’t draw or cut a straight line to save my life, lol. Love some coffee, but only in the early a.m. or I’ll be up as well! Adorable! I love how you dressed up that coffee mug. Where did you get your cricket? I have looked into one in the past but I didn’t know if I would honestly use it. Can you wash the mug in the dishwasher? Thank you!! I actually got mine via the company as an Ambassador. However, you can get the one I have for a lot less now since the 2nd version came out yesterday! You can get it via Michaels, Amazon or thru the Cricut site (I’d do this, it’s a bit less expensive). I LOVE it – very easy to learn and use! I don’t use it as much as I should, but they are fun! Plus, you can give people handmade gifts, make things to sell, etc. As far as the coffee mug, if you use the outdoor vinyl (there are different kinds of vinyl), it is safe in the dishwasher. However, I personally just hand wash mine because I want them to last as long as they can. I’ve heard people say they have no issues when using their dishwasher, but I guess it’s personal preference. Woah that DIY Halloween Coffee Mug turned out so cute! I’m a sucker for coffee mugs and DIY’s so this is right up my alley. Thank you!! It was fun to make! I may have to keep it and make another, lol. Love this! 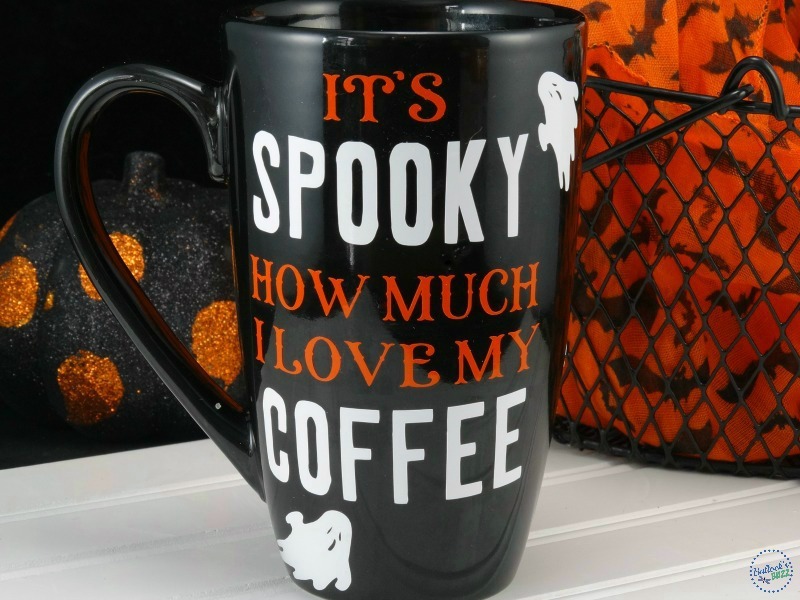 That cup is adorable and I’d use it all year round not just Halloween. Super cute! Thank you! I was very happy with how it came out! This is so clever! I consider myself creative but not necessarily crafty. Thanks for making this relative easy for people like me! I am so happy you like it! Thank you! Keep checking back! I have lots more planned! I like the sppoky design on the mug. I’m such a coffee person so this gives me a good idea for a mug design for my coffee mug. Thank you! I’d love to see what you make! Love your post! And love love Dunkins coffee. So good! Hazelnut Mocha is my favorite! I am addicted to this recipe! SO GOOD! And easy to make, too! That is so awesome. I love these cups, they came out really cute. I would love to make these. 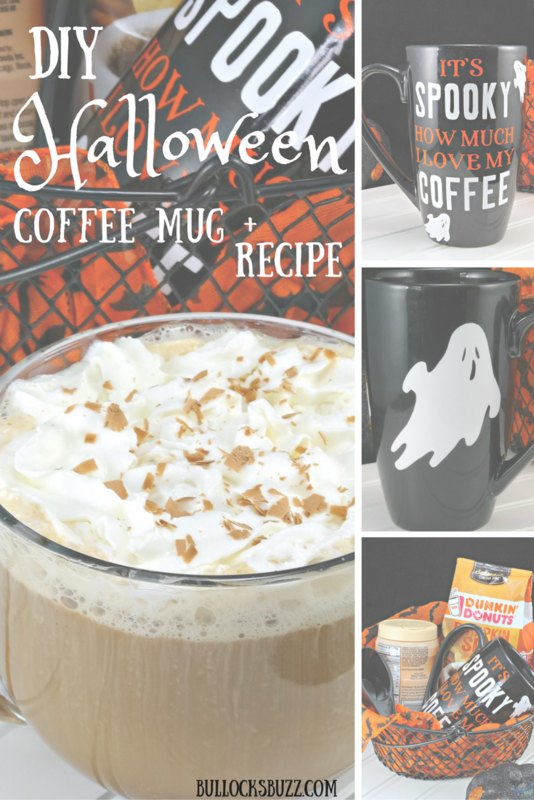 As a coffee lover, I absolutely loved your DIY Halloween coffee mug! Gives me some ideas for a few co-worker gifts! Thank you! I was thinking of doing the same, but for my neighbors! Sort of like a Halloween Boo Kit. You mug is so cute and festive. I’m a sucker for a fun mug and I totally own a Cricut. I just need to get the correct vinyl and I’m so trying my hand as a custom design. Thank you! It was a lot of fun to work on! Definitely go get you some vinyl – the options are limitless! That Halloween mug is so cute! I would love to make my own mugs! Love this idea! i LOVE that DIY coffee mug. we keep dunkin donuts coffee in rotation at my house. everytime we have company, that is always their go to coffee selection.